History is always subject of debates for various reasons. The one which cropped up recently around Bhagat Singh had a new dimension to ‘looking at the past’. This relates to changed perception of a word in the context of current global terrorism. In one of the talk shows, which is the noisiest of them all, the anchor attacked legendary historian Bipan Chandra and the book ‘India’s struggle for Independence’ for calling Bhagat Singh and his comrades as terrorists. The anchor of the show accused the writers of this book, as intentionally maligning patriots, calling them court historians of Congress. Taking off from this BJP MP Anurag Thakur said that martyrs are being denigrated in the book and MHRD Minister Smriti Irani came with the verdict that this is the academic murder of sacrifice of great freedom fighters. It is another matter that over a period of time this group of revolutionaries changed their ideology as reflected in Ramprasad Bismil’s advice to give up “the desire to keep revolvers and pistols” and instead to joins “the open movement”. Bhagat Singh’s own views evolved over time, and he had, by 1929, come to the conclusion that Marxism and broad-based mass movements were the right road to revolution, not individual heroic action. In 1931, addressing his comrades from jail, he presented his nuanced understanding of terrorism as a strategy for action. Contrary to those who are criticizing the book for using the word terrorists for Bhagat Singh and comrades, the term as such was used by the revolutionaries themselves. It was the time when this was not looked down as it is today (from 2001 onwards) due to multiple global dynamics related mainly to control over oil resources. This book ‘India’s Struggle for Independence’ was first published in 1988. Lately from over a decade Historian Bipan Chnadra; when writing about Bhagat Singh on various occasions; did not use this term terrorist for him. 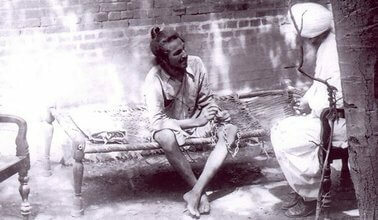 In his introduction to Bhagat Singh’s pamphlet, ‘Why I am an Atheist’, Chandra refers to him as follows, “Bhagat Singh was not only one of India’s greatest freedom fighters and revolutionary socialist, but also one of its early Marxist thinkers and ideologues.” Chandra’s co-authors point out that Chandra held Bhagat Singh in very high esteem and highlighted his popularity in the chapters which he wrote. As per Chandra Bhagat Singh was immensely popular all over the country and people did not take food after hearing about his hanging. It seems the Smiriti Irani and company is trying to take advantage of use of the word terrorist in the book to do away with book itself, as this book has made scathing criticism of communal politics in India. The reading of book makes it clear that Muslim and Hindu communalists both were not part of freedom movement and did not participate in ‘anti-British’ nationalist movement. This is a fact which communalists want to hide and display their patriotism by beating their breasts on such issues like use of word terrorist for Bhagat Singh. There are others from the RSS parivar who think this book has revolved around Nehru and the left alone. Their reading is partisan and motivated. If one reads the book it will become clear that the focus of the book is on the aspects of the anti colonial movement and it refers to all the strands of anti British movement which took place. Gandhi and Nehru both have an unenviable place in the movement; still the deeper dynamics of movement is always at the fore in the book. It gives full justice to Bhagat Singh, Surya Sen and their participation in anti British movement; it has Bose, Patel, Maulana Azad, Jinnah and Ambedkar all in the proper context. The deeper mechanism of mass mobilization, major steps of the movement; its challenges and its evolution over a period of time are outlined in a very objective manner. Since the word terrorism has assumed a totally different meaning currently, since Prof Bipan Chandra is no more, the surviving authors in consultation with other historians can definitely coin a word like ‘militant revolutionaries’ or some such for these great freedom fighters. BJP has played with history to suit its political agenda. In this issue it is looking at one more opportunity to do away with a valuable text book on Independence movement to hide the fact that Hindutva ideology has no role in freedom movement.